The purple nurple stands out like a sore thumb compared to all other pepper varieties. 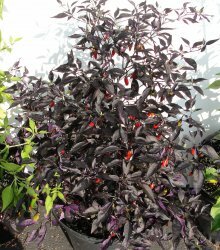 Its foliage is purple and plants produce over 100 hot peppers that turn purple to green-striped to red. Peppers are juicy and the heat level and taste are similar to a tobasco pepper. As one of my squash playing buddies said, "even it the peppers weren't tasty, I would grow the purple nurple just for the looks!!" Even my mail carrier stepped out of her truck to look up close at this variety.